What is your favorite laboratory, classroom, or facility in the Jere A. Chase Ocean Engineering Laboratory? I LOVE the high bay! I have spent a lot of time working in there with both the wave and engineering tanks. I have helped fixed the back beach of the wave tank and have gotten the opportunity to use it to run tests on scale models as well. I have also gotten the chance to scuba dive in the big engineering tank! I did dry-suit training and surface-supplied training in that tank. I even got to do a cognitive test (a puzzle) at the very bottom of it. I am incredibly passionate about the environment. My specific interest is marine renewable energy. I am fascinated by tidal and wave energy, and believe they are part of the future way we will power our world. I think we have incredible resources here at UNH for the progression of marine renewable energy, from out wave and engineering tanks, to the research vessels and offshore testing sites. The OE program here has allowed me to pursue my passion in a very hands on way. Tell us about your experience with a summer internship. I have spent the last two summers at the National Renewable Energy Laboratory in Colorado, working on tidal energy research projects. Most recently, my project was the design and manufacture of a small 400 mm thermoplastic, carbon fiber tidal turbine blade. I modeled the geometry of the blade in the finite element modeling software ANSYS, then fabricated it by vacuum infusing the thermoplastic resin on top of a 3D printed mold. The blade that I constructed was a composite version of an aluminum blade currently used by Cardiff University in Wales for testing arrays of tidal turbines. 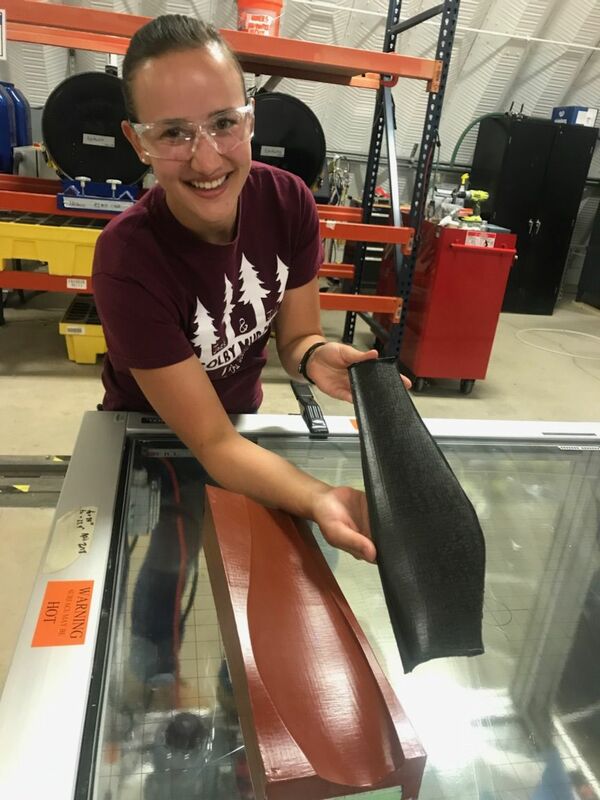 The goal of this research was to determine whether the techniques used in designing and manufacturing this small-scale model are viable for large-scale production of tidal and wind turbine blades; to which I concluded it was. I am a team captain on the UNH Lumberjack team. It is a sport club that has been here at UNH for over 40 years. I compete around New England with other colleges doing traditional timbersport events. I do everything from chopping and sawing, to pole climb and log rolling in the water. The idea of the sport is to keep traditional logging techniques alive from back before machines.